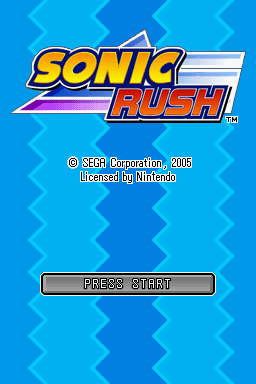 Sonic Rush is Sonic's DS debut, which also introduced Blaze the Cat. See if the Sonic Advance 3 leftover voice clips from the E3 demo are still present. Try the downloadable demo (in the options menu) out for any oddities. There are more unused graphics . A map oddity. Found with the other graphics, and helpfully prefixed with "e3" are these images. They can be seen in the E3 demo. e3_comsoon_jpn.bbg is a bit more descriptive than the _eng version, and says "Thank you for playing. Play the retail version to see what comes next!". z82   . Try acessing the level in game via file swapping, to determine what music, background, timer and collision it uses. The map z13 is an obvious test map, and even has some unused tiles. The name indicates that it should be Zone 1 Act 3. The two Boss Defeated themes normally cut off after around 7 to 12 seconds, but are actually about a minute and 30 seconds each. They can be played at full length in the Sound Test, known as "AFTER THE FIGHT" and "KICK THE EGGMAN" when the game is in English, but they do not feature in the official soundtrack. This page was last modified on 23 January 2017, at 18:50.